The visit to the city of Spoleto is a must for all lovers of the “green heart of Italy”. 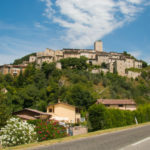 It is a place full of monuments and nature trails as well as a real cradle of typical products of Umbria. Like many villages and small Umbrian towns, Spoleto is perched on a hill, Sant’Elia, nestled under Monteluco. The origins of the name of Spoleto are connected to the structure of these two places: Spao and Lithos. They indicate a large rock detached from the mountain, later called Colle Sant’Elia, on which the city was built. At the foot of Spoleto an alluvial plain,Valle Umbra, is spread out and nearby this plain the river Clitunno flows placidly on its way to Valnerina. The bell tower of the Cathedral of Spoleto stands out from among the roofs of the houses: the Cathedral of Santa Maria Assunta, with its beautiful façade in Romanesque style, is the sacred centre of the Archdiocese of Spoleto and Norcia. On the road that leads us to the cathedral, the Roman Theatre is worth a visit. It was built in the first half of the 20th century. The semicircular layout of the theatre is the perfect place for shows and concerts, which are often organized in this fascinating setting. La Rocca Albornoziana is certainly one of the most impressive buildings in the city. It is one of the many fortresses built by Cardinal Egidio Albornoz. It was a prison until 1982 and it has been home to the National Museum of the Duchy of Spoleto since 2007. 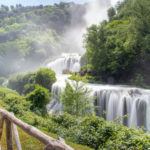 Starting from here, it is possible to undertake the so-called “giro dei condotti”, a trail that follows the traces of the ancient aqueducts of the city, passing through the massive Ponte delle Torri from the Roman era. If you walk in the nature that surrounds Spoleto instead, you find the path of Monteluco with its sacred wood. This 8 km walk allows you to admire a convent built by Saint Francis in 1218, surrounded by a holm oak grove and by an almost surreal mystic atmosphere. After a long walk, it’s time to enjoy a culinary break with some typical products of Umbria. The black truffle is not only the king of the forest but also the king of Spoleto and its gastronomic tradition. Not far from the city centre, another typical product of the Umbria region is grown: the only PDO spelt in the world is cultivated in Monteleone di Spoleto! Moving on to dessert, the typical Spoleto sweets are crescionda – made from amaretti biscuits and chocolate – and gingerbread, rich in dried fruit and spices. 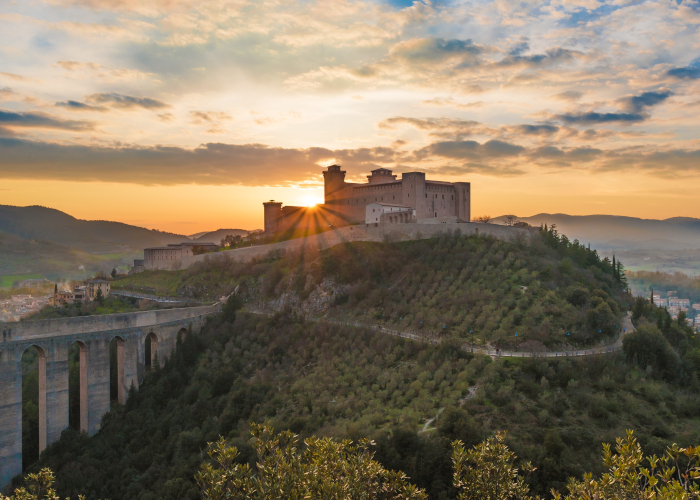 The best time to visit Spoleto is the end of June on the occasion of the famous Festival dei Due Mondi , which combines local traditions with those of distant America. 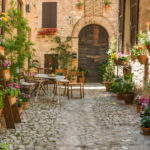 An opportunity not to be missed to discover the true soul of this Umbrian city, its typical products and its many wonders.